FDT-40 Series ultrasonic flow and energy meters clamp on to the outside of pipes and do not come in contact with the internal liquid. The technology has inherent advantages over alternate devices including: low-cost installation, no pressure head loss, no moving parts to maintain or replace, no fluid compatibility issue, and a large, bi-directional measuring range that ensures reliable readings even at very low and high flow rates. FDT-40 Series is available in a variety of configurations that permit the user to select a meter with features suitable to meet particular application requirements. RS485 Network All FDT-40 meters come equipped with RS485 drivers and utilize a MODBUS RTU command set (data can be returned in single-precision, doubleprecision, integer or floating point values). Up to 126 units products can be run on a single daisy-chain network and be individually queried for flow rate, positive flow accumulator, negative flow accumulator and signal strength. Flow accumulators can be cleared at discrete addresses or globally. The RS485 network is also compatible with direct to Excel, application. 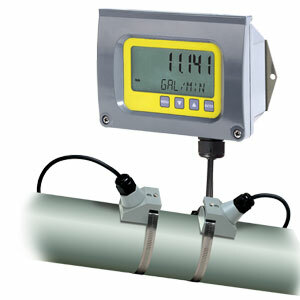 Transducer for pipes over 24"
참고: FDT-40 Series Flowmeters come complete with operator’s manual. Accessory transducers come complete with mounting gel.